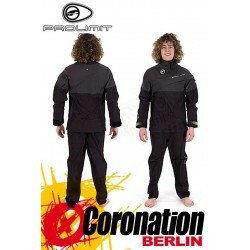 Ocean Rodeo IGNITE Drysuit / Trockenanzug: One piece drysuit Dual Function Drysuit / Foul Weather Gear! Blurring the lines between foul weather gear and traditional drysuits the Ignite is loaded with expedition style features and is designed to be worn for extended periods of time above and beyond a quick after work session. Featuring our revolutionary Captive Zip1 design, the Ignite has merged drysuit water integrity with the comfort of traditional foul weather pant & jacket combinations. When worn in full dry mode, the Ignite is 100% dry. 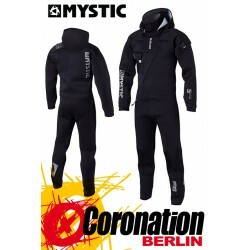 In modest conditions or when relaxing between sessions the Ignite is quickly converted to standby mode by opening the dry zip and doffing the neck seal. 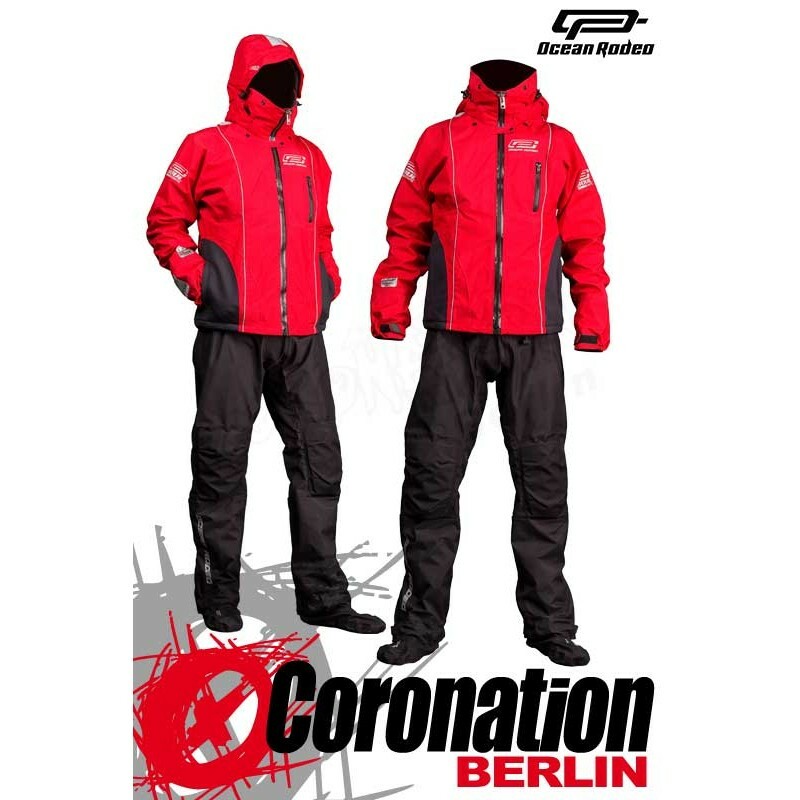 With the over jacket then zipped up the Ignite provides ventilation and protection on par with, or superior to other leading foul weather gear ensembles. Converting from standby mode to full dry mode can be easily accomplished all while wearing your PFD. 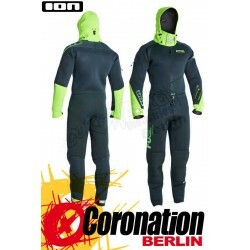 As added security weve added a wader belt at the waist to restrict water entry into the lower suit due to accidental submersion when worn in standby mode and added highly reflective patches and inks to the outside of the suit. 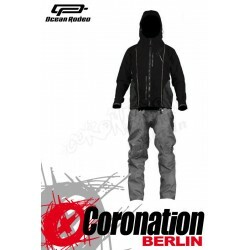 Ocean Rodeos waterproof breathable 3 layer material is designed specifically for drysuits, featuring a salt water resistant non-porous, hydrophilic polyurethane (PU) breathable membrane. Extensive testing was undertaken to ensure long lasting resilience against the harsh salt water environment and high pressures encountered by extreme water sports athletes. 200 Denier Nylon/Taslan with DWR finish. The tough outer fabric is coated with DWR to repel water while allowing sweat release from within your suit. (MIDDLE) NON-POROUS, HYDROPHILIC POLYURETHANE MEMBRANE BREATHABLE MEMBRANE. (PU). VENTOR works well in both fresh and salt water environments and does not break down with extended salt water use. 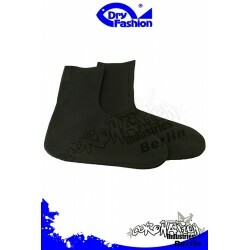 This is the part of the suit that keeps you dry. It allows sweat vapor out while not letting any water in. (INSIDE) TRICOT: NYLON 18 DENIER TRICOT SCRIM. The inside mesh layer helps protect the PU breathable film. This is what you are looking at inside the suit. 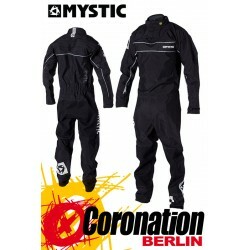 Ocean Rodeo IGNITE Drysuit / Trockenanzug - Jetzt bei uns im Shop!